Nearly everyday you can hear some someone driving down Cherry Hill, coming to or from Canton or Inkster. Well, you can hear a lot of vehicles, but the ones you’ll notice are those with the loud exhausts! Some are built that way with a custom exhaust system, but all too often, it is a bad muffler. With a simple muffler shop near me search on their phone, those people can find the best Muffler Shop in Westland! A car’s muffler is made to carry out two functions. The first is to direct the exhaust gases out of the engine and through the exhaust pipes. The second, and possibly the most important, is to reduce the usual deafening sounds of the exhaust gases exiting the engine. Mufflers generally last between five and seven years on American-made vehicles. There are circumstances, however, that a muffler can untimely fail. This includes; being exposed to massive amounts of salt, being frequently hit by curbs, potholes, speed bumps, etc., and excessive use. Is it time to get your muffler replaced? Here are some general warning signs that your car’s muffler is failing and in need of repair or replacement. When any components in the exhaust system are damaged, it can impact vehicle performance, including engine misfiring. If there is a hole inside the muffler, it will lose its efficiency and can cause engine misfires. 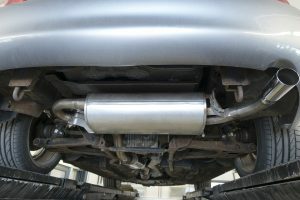 When the muffler is damaged, it causes the exhaust to leak, increasing the sound that comes out of the exhaust system. This is pretty common. Excessive condensation coming from the exhaust pipe is a sign that the muffler is rusted and wearing out. If your muffler does need to be fixed, you should do that immediately because there are risks involved. Did you know that you can get a ticket for not having an adequate muffler? Each state is different in its laws concerning vehicular maintenance and muffler status. In Michigan, you can get pulled over under suspicion of loud exhaust if the officer has a DBA meter, a meter to register sound. If you have a defective muffler, the police officer can ticket you for defective exhaust or defective muffler. Mr. Muffler is the best car maintenance shop in and around Westland, Canton, Inkster, Garden City, and Livonia to name just a few nearby cities in Southeast Michigan. Our mechanics that replace mufflers in Westland are very attentive to customers. Not only do they have decades of experience in dealing with vehicle repairs but they also have excellent customer service. We also offer exclusive deals such as $10 off major repairs and a $65 exhaust repair! Come in today to get a quote or contact us through our website. We can’t wait to meet you!